According to the new "Landmarks" book, the Oxford Junior dictionary recently removed some words which the editor considered less relevant to today's young people. These exclusions included: acorn, ash, beech, bluebell, hazel, ivy, fern, lark, mistletoe, newt and otter. Such words had to be removed to make space for these more relevant words, amongst others: blog, chatroom, MP3player, broadband, attachment and voice-mail. This change, which is said by the editor to reflect the reality of modern-day children's urban lives, is alarming in its acceptance that children might no longer "see the seasons, or that the rural environment might be so unproblematically disposable." 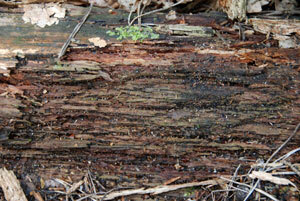 Macfarlane has an absorbing obsession about both the countryside and about language. Putting the two together, he has produced a beautifully written book that examines how people think about their outdoor surroundings and particularly how a fertile language has developed around the country. But, he also brings out the sheer depth of vernacular vocabulary of people who work with the land.For example, on the island of Lewis there are literally hundreds of gaelic terms to describe peat moorland; the risk the book alerts us to is that as the rural way of life dies out, and as language is homogenised, this rich and nuanced language will be lost. The book is both about celebrating what language has been built up about the landscape and about preserving it. Each chapter contains a glossary and woodland enthusiasts will be particularly interested in the eight pages on woodland words. These include the Herefordshire word "cag" which means the stump of a branch protruding from a tree, or the Cotswolds term for decayed wood - "droxy". Woods themselves have unusual names such as "roughet" which in Kent means a small wood on its own without large trees, or a similar woodland in Exmoor might be called a "copsy". He also forages for poetic words - "leaf-whelmed" when dense foliage limits what one can see, or "suthering' being the noise of the wind through trees. The book is massively informative and contains countless anecdotes but it is also a good series of yarns as Macfarlane cannot resist a good story, especially when it involves the natural world. About our changing lifestyles, he tells of the 2012 report "Natural Childhood" which showed that between 1970 and 2010 the area in which British children were permitted to play shrank by 90%, and the number of kids playing in "wild" places dropped from one in two to one in ten. As the book reports, nine out of ten children can identify a Dalek but only three out of ten can identify a magpie. 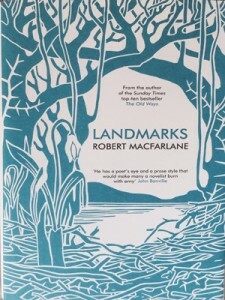 "Landmarks" is good value at £20, but you'll get an even better experience if you read the book outdoors! His other books with similar themes are "The Old Ways", "The Wild Places" and "Mountains of the Mind". Angus, Macfarlane is one of those authors I have been following since reading “The Old Ways” & I just can’t put his books down. His tales & anecdotes have led me on to read many of the writers he enjoys, like the late Roger Deakin. Like you I was shocked by his mention that a word like ASH, my namesake, & many other words I take for granted were left out of the Oxford Junior dictionary! Here in Northern Ireland there is very little woodland for children to explore & recently on a visit to a woodland community project I was horrified to learn that some of the children attending from the city claimed they hadn’t seen a tree before!! !